My new tool for creasing card stock—works a treat! Although the process is explained simply enough in the steps above, actually fiddling with the correct alignment takes far, far longer than you might think. The crease has to be exactly in the right place to fold the cards square. Got there in the end though and sure beats creasing by hand. 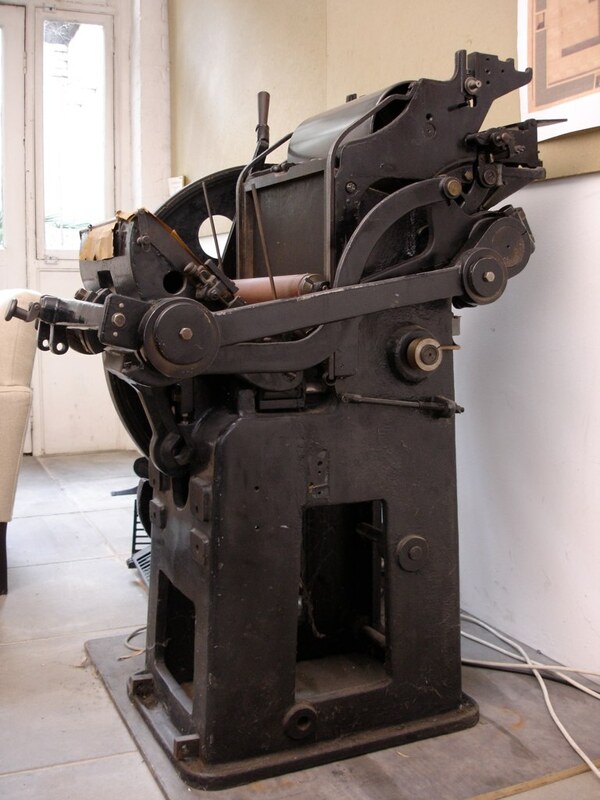 Certainly appreciate the versatility of these old machines—you can even die-cut and perforate if you ask it nicely! I’ve recently christened the press with ink and printed the very first official job on the Vicobold. This is a momento of thanks to all those people who’ve helped me get this far. Most of my linocuts to date have been single colour prints. Only a couple have involved two colours; the key block is cut and printed first and then a second block is printed in registration to add another colour. Basically, an elaborate colouring in exercise. A more exciting use of colour however, is the process of layering several coloured blocks to create a totally new, combined image … one that may not be fully understood until all the necessary blocks have been printed in situ. This requires a totally new thinking process as you cut the blocks—still trying to bend my brain around it! I’ve started with a simple image of a letter ‘a’ as an icebreaker. If anyone would like a print, drop me a line. Fast forward a few months and the press finally sits behind me in the studio, cheerfully ignorant of how awkward it had been to coax it up three flights of stairs from a basement plus another set into its first floor home. This involved stripping the machine down completely which, while not ideal, at least tells you a lot about how it all works. It also affords a rare opportunity to clean in those hard-to-reach places, although since being re-oiled and greased up again you’d barely notice anyone had bothered. Presses are happiest when rolling in their own filth apparently. A special thank you to all those who helped me to dismantle, move, reassemble and get the press printing again—a massive team effort all round. Now to concentrate on putting it to good use. So here it is—my ‘new’ parallel impression platen printing press—sitting patiently in its former home awaiting the weekend along with all the fun and games moving it out of its current basement-level situation and into my first floor studio. Despite some attention needed to fix the ink duct mechanism and a missing oscillating roller (necessary to spread ink evenly across the machine) it appears to be in good working order. The next few weeks will probably result in far more fiddling, tinkering and head-scratching than ink on paper, but such delights are reserved for future blog posts. Right now, this feels like a brilliant idea. Exciting stuff! I’ve been using and collecting letterpress equipment for a little while now, but acquiring such a machine makes me feel that it’s worth documenting my exploits into letterpress and relief printing—guess you never know where these things may lead.